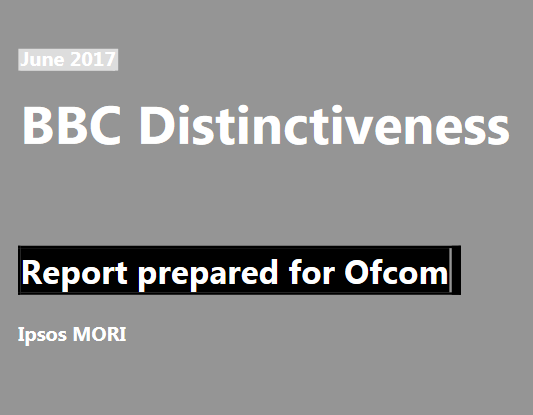 In June 2017, Ipsos MORI Social Research Institute published a report prepared for Ofcom entitled “BBC Distinctiveness”. On April 3th 2017, Ofcom became the BBC's first external regulator. Ofcom has designed a framework to ensure that the BBC continues to deliver on the existing objectives re-affirmed by Parliament: accurate and impartial news and current affairs; education and learning; reflecting and representing the diverse people and nations of the UK. A new criterion was introduced: delivering distinctiveness - that hard-to-define-and-measure special something that a national, licence fee-funded PSB must produce, and which it is now Ofcom's responsibility to define and measure. Ipsos MORI conducted deliberative workshops across the UK to highlights how the BBC remains the foundation of public service broadcasting (PSB). Moreover the purpose of this report is to understand what the audiences’ expectations are in an ever-changing sector. It should be underlined that distinctiveness is essential to the BBC in justifying its public funding. The research is comprised of large deliberative workshops, smaller workshops and in-depth interviews with a total of 131 participants. The research’s methodology is perfectly detailed in the report. Overall perceptions of the BBC: the BBC was thought to offer consistently high quality content and valued as a trusted British institution. Even if the BBC radio and online services were valued, some younger participants were more critical about the BBC television services. Some participants were concerned about the BBC being an older persons’ channel. Opinions on the BBC’s role in society and the new public purposes: Providing impartial news and information was considered the most important purposes by the participants and it is considered as a historic strength of the BBC. However the BBC’s TV news is regarded by some participants as the “voice of the establishment” notably concerning the EU referendum in 2016. The report covers and analyzes the four other public purposes: to reflect, represent and serve the diverse communities of the UK; to support learning for all ages; to show the highest quality, most creative and most distinctive outputs; and to reflect the UK and its values to the world. Distinctiveness and the BBC: The report not only describes how participants defined the distinctiveness of the BBC but also highlights how BBC could be more distinctive. Even if the BBC was felt to be distinctive as an organization and for its content, the level of risk-taking, innovation, challenge and creative ambition of the BBC was the most contested part by the participants.